For children and teens from 10 to 17 years old. Learn a language by discovering a country and its culture! Learn a new language directly at the source, in the country where it’s originally spoken. Our language holidays are the ideal solution to open up to the world, discover a new culture and make new friends. More than just a language course, you'll have enough free time to enjoy your vacation, explore your host country, discover local attractions and become a citizen of the world. Our language courses take place in summer for a duration ranging from one to four weeks in full immersion. HIGHLIGHTS: Nike Camp in San Domenico California! The Nike Sports Camp is located on the beautiful, secure campus of the San Domenico School in San Anselmo, California, where students have exclusive access to campus facilities. Young people aged 10 to 17 have a unique opportunity to discover this jewel of the United States, learn English and indulge in their passion for sports. In addition to their daily English classes, students can choose from the following Nike sports options: basketball, football, swimming or tennis. As a result, young people feel comfortable with English while interacting with coaches and teammates around the world. The perfect combination of intensive language courses and high-level sports training. "ALL-IN" program: language courses, registration fees, teaching materials, campus accommodation, full board, travel and medical insurance, airport transfers, activities and excursions. A major element of the Berlitz® method is total immersion in the target language. Outside of traditional language classes, exciting activities allow you to put your new skills into practice, discover your host country and make new friends. So your self-confidence and your ability to communicate in a foreign language improve. Our trainers are experienced and native to the language taught. They are at your side throughout your stay to ensure your well-being. All you have to do is choose your dream destination and embark on this new linguistic adventure! 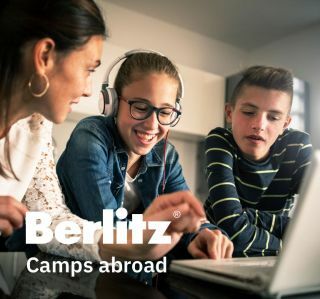 Contact your local Berlitz center to receive more information on dates and destinations.